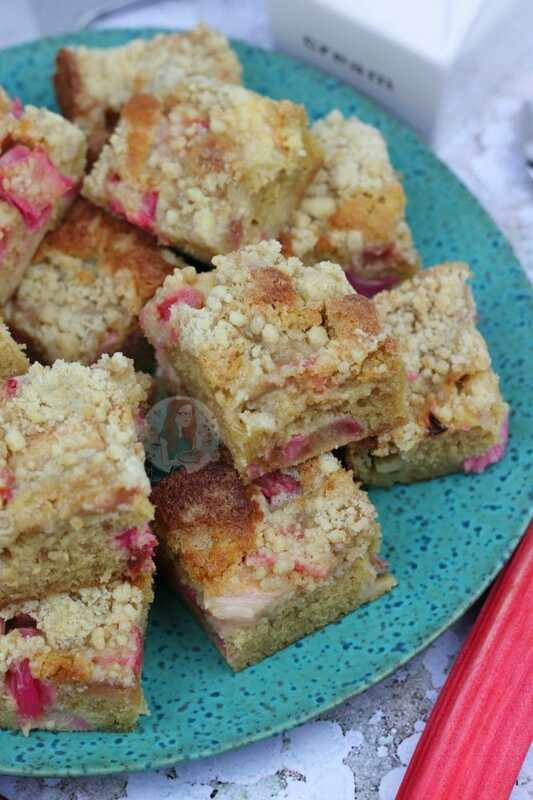 Easy, Delicious, Rhubarb Crumble in Cake form… What could be better than Rhubarb Crumble Cake?! So quite a while ago I shared my recipe for my Apple Crumble Cake, and its always been a hit since. Apple crumble is probably the most common crumble, with rhubarb coming a close second… this could be completely wrong, but in my life its this way round. 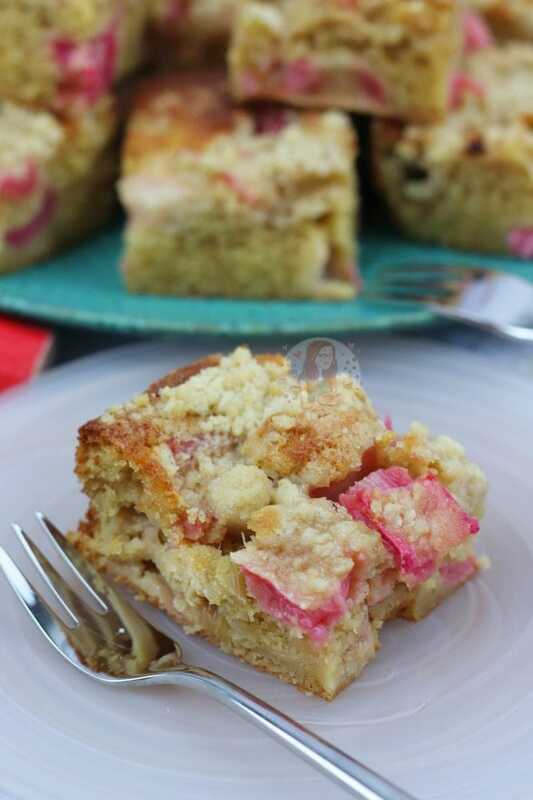 But anyway, since the day of posting my Apple Crumble Cake I have had requests for a rhubarb version… so here it is! 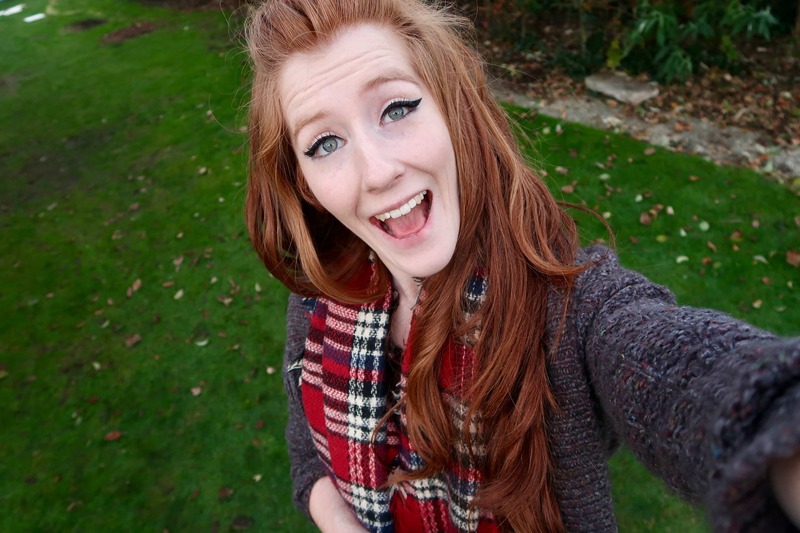 Slightly different, but here it is! I didn’t want to make the cake the exact same as my other one, so its just a regular traybake cake. You could say this is boring, but I bloody love a traybake cake! 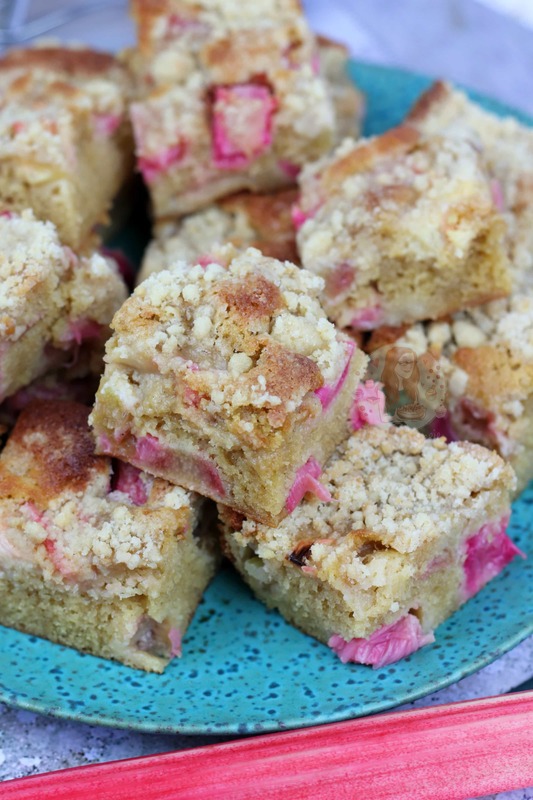 You can see the chunks of rhubarb in every slice, and its just beautiful. I’ve used regular rhubarb, and forced rhubarb, and both have worked well. I don’t cook my rhubarb before baking, as I often find it softens enough after being in the oven for over 30+ minutes! I often find that regular rhubarb is a lot greener, and can taste more tart in comparison to forced rhubarb, but I do think its a matter of preference… and what you can find in the shop. My local Waitrose stores have quite a lot of forced rhubarb in, as well as a few regular.. whereas other supermarkets just have regular. This might be my local stock, but both work well! 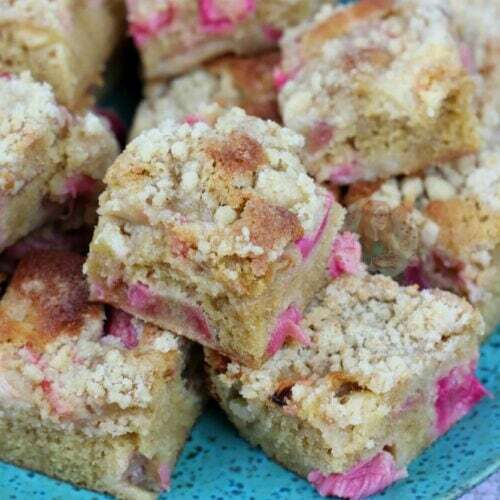 Often forced rhubarb ends up a tad softer than the regular. The cake is basically just a regular sponge cake, with rhubarb added in, and crumble mixture on top. It therefore takes a little longer to bake, but thats totally okay. The added moisture from the rhubarb keeps the cake soft as well and prevents it getting dry. The crumble part is completely optional, but its just so damn good! You can make this into a delicious layer cake, like my Apple Crumble Cake, but its up to you! You can use the same quantities as the Apple one, and follow its recipe, simply swapping to rhubarb. However, if you do this, it might turn out slightly mushier, but I’ve done it a couple of times and it was fine! The best topping if you made this into a layer cake however, would be to make it CUSTARD FLAVOURED! 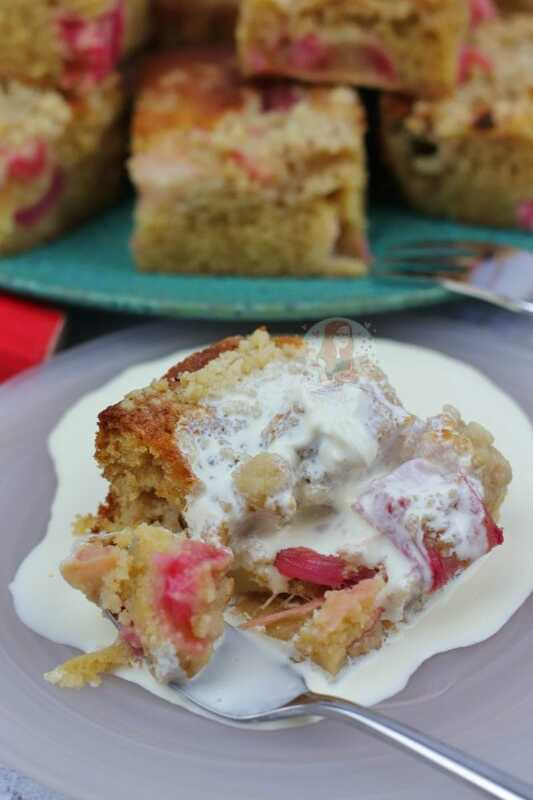 Imagine it… Rhubarb Custard Cake! Heaven basically. 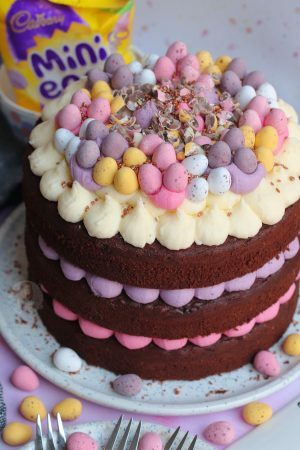 For a two layer cake, I would use… 250g Unsalted Butter, room temperature, 500g Icing Sugar, 1/2tsp Vanilla Bean Extract, and 75g Custard Powder! Its basically the same recipe as I use in my Custard Cream Cupcakes, and its a winner! 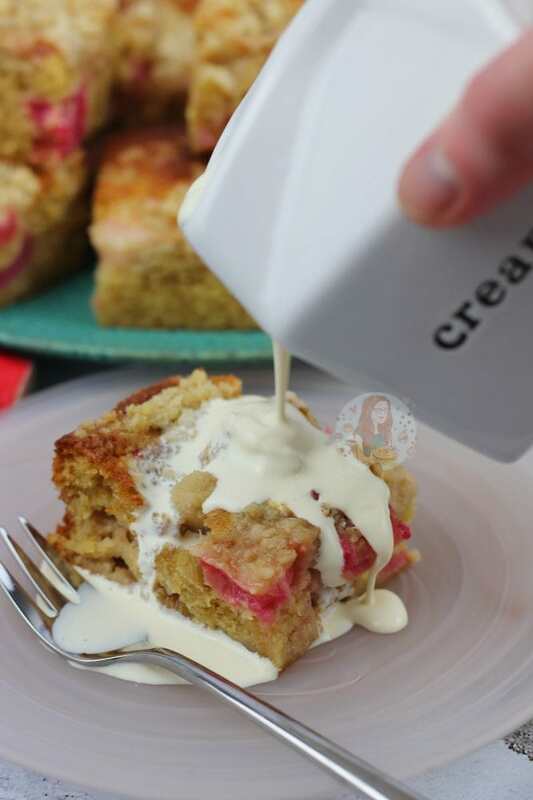 Easy, Delicious, Rhubarb Crumble in Cake form... What could be better than Rhubarb Crumble Cake?! Preheat your oven to 190C/170C and line a 9" Square Tin with parchment paper. Beat together your Butter and Sugar together till light and fluffy. Add in the Flour, Eggs and Vanilla and beat again till smooth. Mix your chopped up rhubarb (about inch size pieces) with the other 50g of Sugar, and then pour half into the cake mixture. Mix together and pour into the tin! 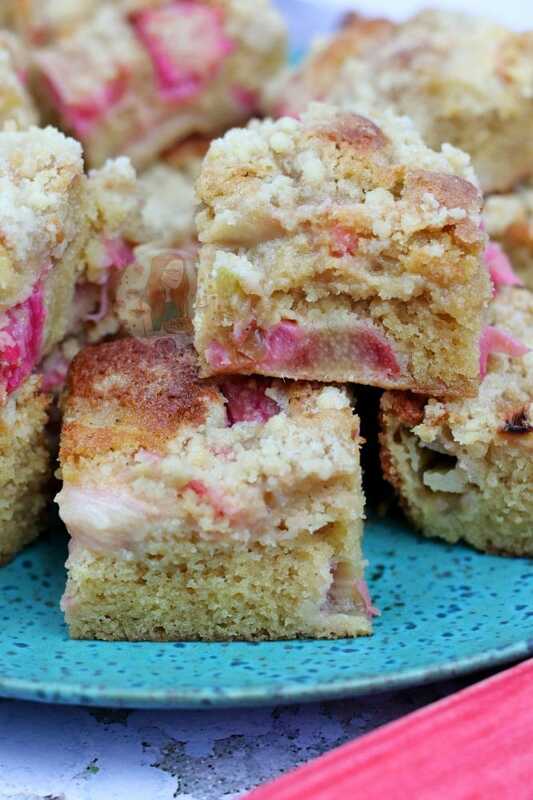 Put the rest of the rhubarb on top of the cake evenly, and then cover with your crumble mixture! You want it to be no more than 1cm thick otherwise it wont bake properly! Bake the cake in the oven for 30-40 minutes. It shouldn't wobble when done, and the crumble should be a lovely colour on top! Leave to cool fully, cut up into squares, and then serve how you like! This cake should really be stored in the fridge due to the fruit, but should be fine out on a colder day. This cake will last 3 days after baking! My crumble mixture is these ingredients, rubbed together to resemble bread crumbs. I won't always use the crumble mixture in the cake, but its worth making the ratios the same if you're going to make a smaller amount! You can use regular rhubarb, or forced rhubarb, but forced rhubarb is generally sweeter and pinker. I served mine with cream, but you can easily serve it with custard, or evaporated milk for example! Older Next post: Lemon Elderflower Cake! Newer Previous post: Lemon & Blueberry Blondies! 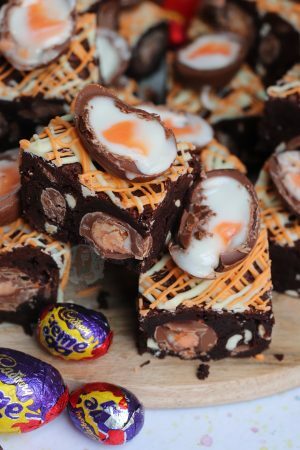 Just made some of these for work tomorrow, for a coffee break treat for the office. Think next time maybe I shall use less rhubarb, I also did my own crumble mix with oats. Made this today. Turned out great, I used a bigger baking tin so they’re more like slices but as I’ve made them as a dessert for tonight the size is about perfect. Will serve with extra think double cream & strawberry garnish. I would love to find rhubarb in Spain to make these. 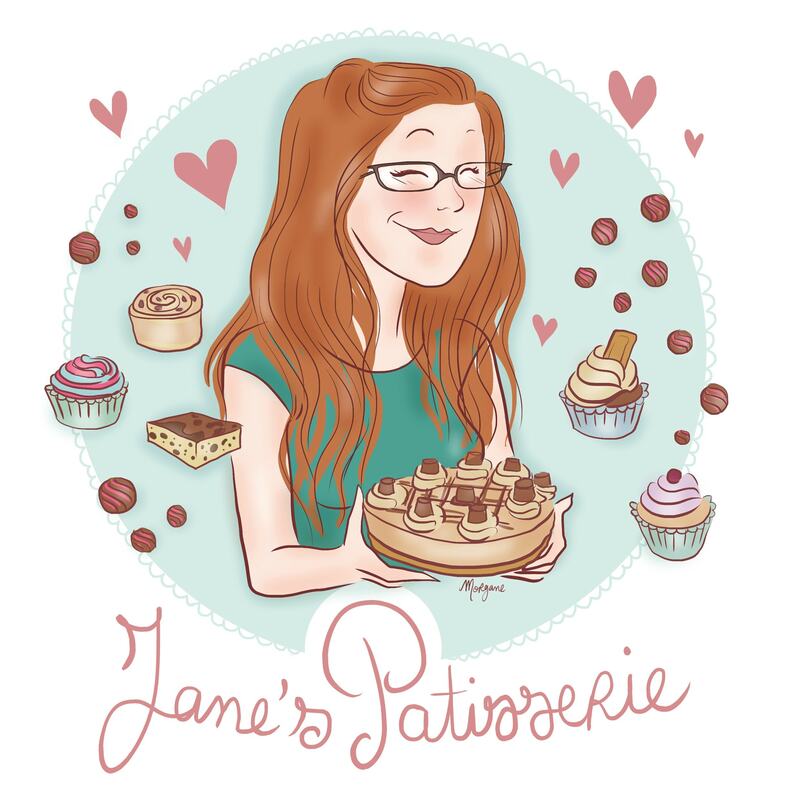 I’ve been following your fabulous blog for about a year now and have tried many of your delicious recipes, from brownies to cheesecakes and all the good things in between like your fudge. Just this weekend I gave your chocolate doughnuts a go. They went down so well that I ended up having to make two batches. Anyway, I just wanted to give you a massive THANK YOU ! 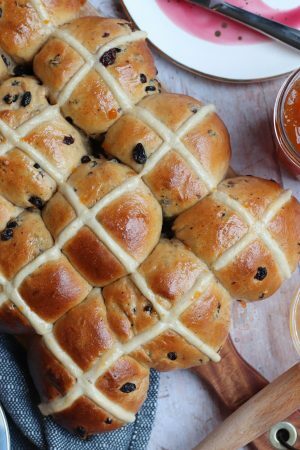 I absolutely love this blog and your recipes. The recipes are so clear and easy to follow and I also love the commentary and tips your provide with each recipe. I love getting the notification that you have posted a new recipe and always click on to check it out straight away! 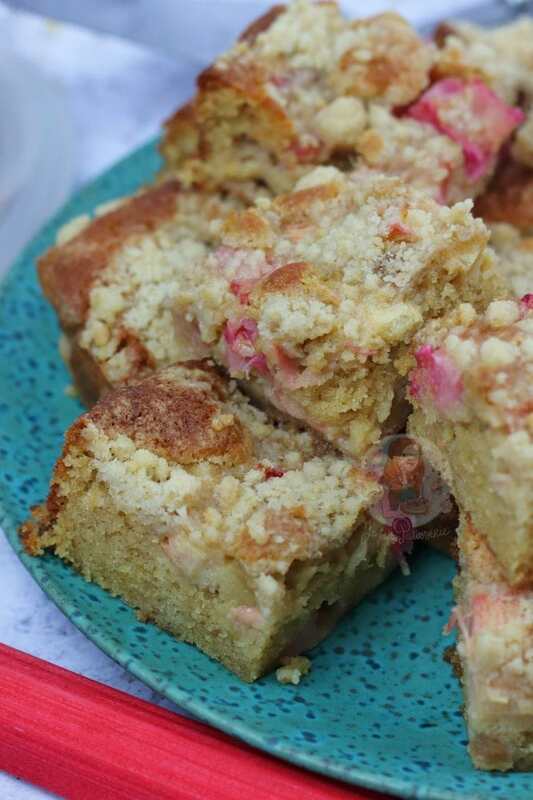 Well this week it was like you had read my mind, I’m totally addicted to rhubarb right now and was trying to find some nice rhubarb recipes just yesterday and then bang, you post the most delicious looking rhubarb cake ever! I’m a sucker for a crum topping. I cannot wait to try this recipe next. I’ve never commented before but I really should have to thank you sooner. Everything I’ve made using your recipes has always been a massive hit! You’re so talented and creative. Thanks again for all the yumspiration. Your recipes rock!